Be the first to share your favorite memory, photo or story of Caellah. This memorial page is dedicated for family, friends and future generations to celebrate the life of their loved one. 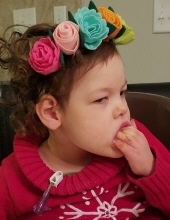 Little Miss Caellah Ireland Allison, five year old daughter of Jerry and Laverne M. Allison of Mount Olive, passed away Tuesday afternoon, April 2, 2019 at UNC Pediatrics Hospital in Chapel Hill. Her short and innocent life will be remembered Saturday, April 6, at 11 a.m. at First Presbyterian Church of Mount Olive, officiated by the Rev. Steve Wicks and the Rev. Troy Lesher-Thomas. The family will receive friends immediately following the service in Baker Fellowship Hall of the church. In lieu of flowers, memorial gifts may be made to caellahallisonmemorialfund@outlook.com (to establish a nonprofit organization to assist families with medically complex children). Along with her mommy and daddy, Caellah is survived by a brother, Connor, and two sisters, Carissa and Carrigan, all of the home. She was loved very much by her family and will be missed so much. Great comfort her loved ones have in knowing that she is in the loving arms of Jesus, and He will take care of her until the family meets her again. To send flowers or a remembrance gift to the family of Caellah Ireland Allison, please visit our Tribute Store. "Email Address" would like to share the life celebration of Caellah Ireland Allison. Click on the "link" to go to share a favorite memory or leave a condolence message for the family.